The Raintown Review Anthology Coming Soon! It was Quincy who volunteered to keep an ongoing file of our pick of the poems from each issue—the poems that surprised us, revitalized us, or brought tears to our eyes (Okay, that was mostly me.) All I did was agree to the plan, say yeah or nay to a few poems, and confirm that when we felt ready, Barefoot Muse Press would publish and administer it. We felt ready early this year. We got the manuscript planned, Jeff invited the poets whose poems we wanted to publish (most of whom responded with an eager yes), and we even arranged to have the launch reading at Poetry by the Sea 2015. And then, in March, my mum got sick and passed away a month later. Needless to say, the plans for the Raintown Review anthology went on hold. It was hard enough for me to be in England for 5 weeks looking after my Dad and coping with my mum’s hospitalization, while trying to distance teach my Poetry & Math class at Stockton, and continuing to manage the website and the registration for the Poetry by the Sea conference. Everyone was naturally very understanding, and the reading for the anthology at the conference went ahead with no physical book in sight! 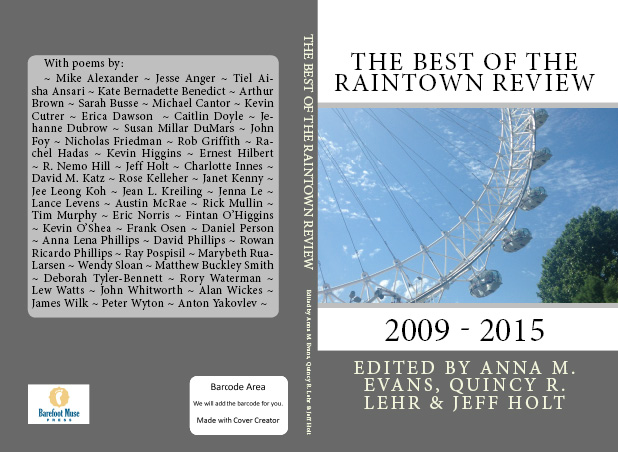 But now at last the physical book of the Raintown Review anthology IS in sight! I’ve been working on the layout and the cover design today, as you can see, and the preliminary pre-order page is now up on the Barefoot Muse website. (Pre-order for $12 or $10 for additional contributor copies.) 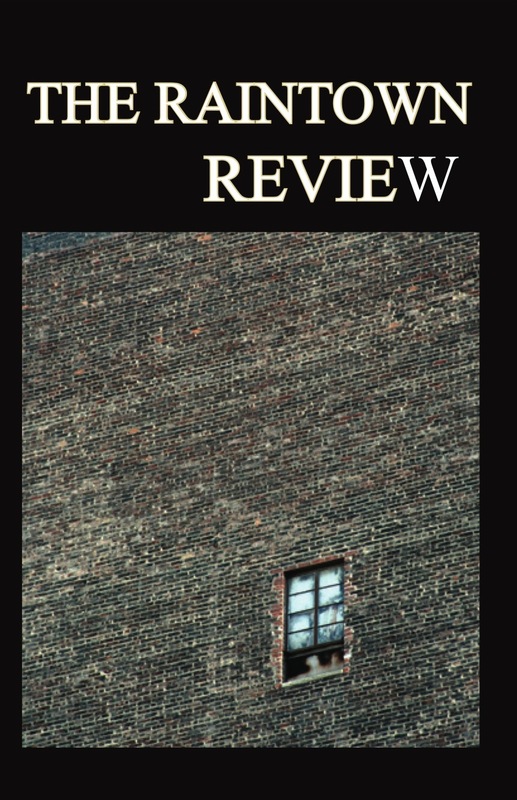 And, ladies and gentlemen, I am psyched, because the one thing you already know about the Raintown Review anthology—just look at that contributor list!—is that the poems are shockingly good. Okay, so I have not been a devoted blogger lately. In fact a certain friend of mine, who has checked my blog religiously for over 2 months now (or so she says) will be positively amazed to see her daily ritual turn up a result. Said result is not due to any tardy enforcing of a New Year’s Resolution, by the way—I keep those for things I am even less likely to accomplish, such as losing ten pounds and giving up wine—but to the long-awaited arrival of my latest love-child. 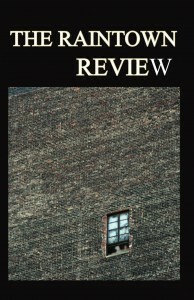 No, not a baby brother for Becky and Lorna, but Volume 8 Issue 2 of The Raintown Review. And that might mean YOU!